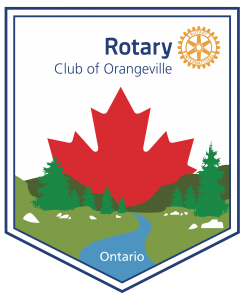 Chartered in 1937, the Rotary Club of Orangeville has served our community with energy and dedication. Rotarians are people from all walks of life, living in and around Orangeville, united in our commitment to serve our local community and the broader world community. Chartered in 1937, RCO has a long and successful history in the Orangeville community. Read about our beginnings with Charter President Jack MacAdam Aiken and the people and years that followed. Over 80 years of service. RCO fundraising efforts range from ticket sales to very special events, including; Orangeville Rotary Ribfest, Beer Fest, A Taste of Scotland, Industry Luncheons, Golf Ball Drop Lottery, Dinner of the Month and much more. Make Orangeville Shine, Fendley Park Splash Pad, Orangeville Sports Hall of Fame, Island Lake Trails, Rotary Park/Skateboard Park, Headwaters Health Care Centre. 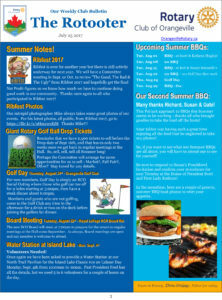 Some of the many causes that keep the Rotary Club of Orangeville busy. Created in 2005 by RCO, the Orangeville Sports Hall of Fame recognizes athletes who were born in our town and went on to achieve greatness in sport, or who, while living here represented Orangeville at a high level, as an athlete or builder. 2nd & 4th Tuesday of the month – 6:00pm.